They may be pretty, but prickly pear needles are painful. While not normally life-threatening, cactus needles will cause your pooch some discomfort. A heavy infestation of needles requires immediate veterinary attention, but a single needle or two can be removed at home. Schedule your dog for a follow-up to make sure your pup is free of infection. Evaluate the severity of the needle infestation. If there are just a few needles in a non-vital area such as the dog’s leg or muzzle, you can attempt to remove the needles at home. If they are stuck in the dog’s eyes or inside his mouth, head to your vet’s office at once. Slip a soft muzzle over the dog’s nose and buckle it behind his head. Cactus needles are extremely painful, and the muzzle will keep the dog from nipping in pain. Soak a folded paper towel in warm water and lay it over the top of the first needle. Pinch the needle between your fingers and pull it quickly out of the skin. The damp paper towel provides grip and acts as a mitt to catch loose needles. Grasp short or slippery needles with a pair of hemostats. This special tool looks like a pair of scissors with ridges at the tip, and these ridges bite into the cactus needles and remove them without slipping. Pinch the needle as close to the skin as possible and pull out in one smooth motion. Remove tiny needles with a pair of tweezers. Squeeze the needle between the tip of the tweezers and pull it out in the direction of hair growth. Twisting or turning the needle will cause it to dig deeper into the skin, so pull it straight out. Wash each needle hole with warm soap and water, and dry with a clean paper towel. Dab on a bit of antibiotic ointment to combat infection, and call your vet to schedule an appointment. 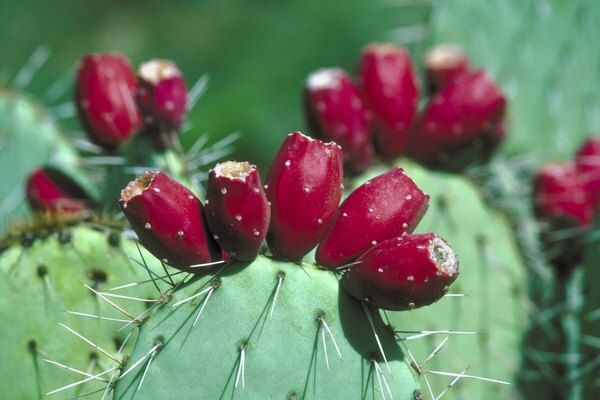 The simplest way to treat cactus needles is to prevent them. Remove all cactus plants from your property and keep you dog leashed while walking through cactus-prone areas.